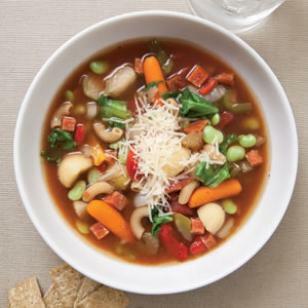 We love this healthy soup and it fits right into a low calorie menu! Feel free to substitute the lima beans for a can of beans of choice (kidney, black, lima, small white, etc.) and substitute the endive for spinach or kale. If you use fresh vegetables, cook the soup for 20-30 minutes, or until vegetables are done. Then add the endive at the end. Heat oil in a large saucepan or Dutch oven over medium-high heat. Add bell peppers and cook, stirring, for 3 minutes. Add broth, oregano and thyme; bring to a rolling boil over high heat. Add pasta and cook for 3 minutes less than the package directions. Add mixed soup (or stew) vegetables and lima beans. Bring to a boil over medium-high heat; boil until the vegetables are almost tender, about 3 minutes. Stir in tomatoes, pepperoni and endive (or chard); return to a boil. Adjust the heat and simmer until the endive (or chard) is just tender, about 5 minutes. Season with pepper and garnish with Parmesan, if desired.